Modern cars really make owning a vehicle easy. They are easy to drive, comfortable, get good gas mileage, and break down far less often than cars in the past did. Unfortunately, this high level of reliability also has a downside. Increasingly, car owners are being lulled into a false sense of security and are as a result, neglecting their vehicles. Many drivers don’t even realize how something as simple as not regularly changing the oil can seriously damage their car, shortening its life and affecting its reliability as well. To prevent the chance of this damage occurring, it is vital to conduct regular oil changes in order to keep your engine healthy. When asked why they didn’t change their car’s engine oil and filter in accordance with the guidelines recommended by the manufacturer, the vast majority of drivers cited cost and the inconvenience of putting their car into the repair shop as their main reasons for not doing so. 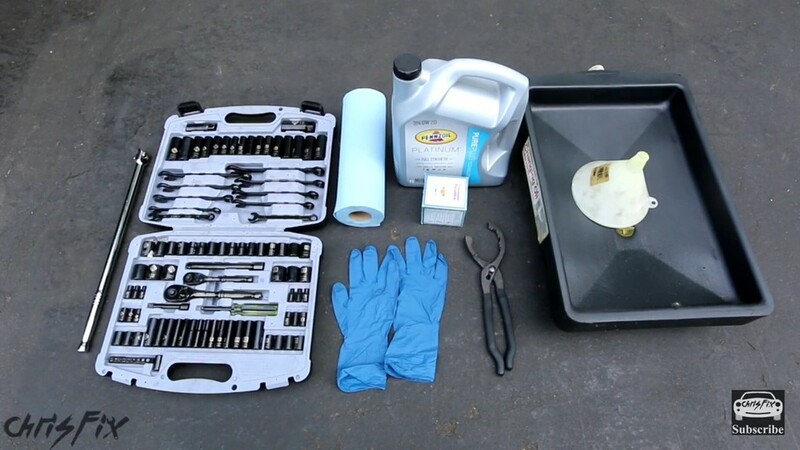 The great news is that by following these easy steps, it is now possible for you to save money by changing your car’s engine oil and filter all by yourself. 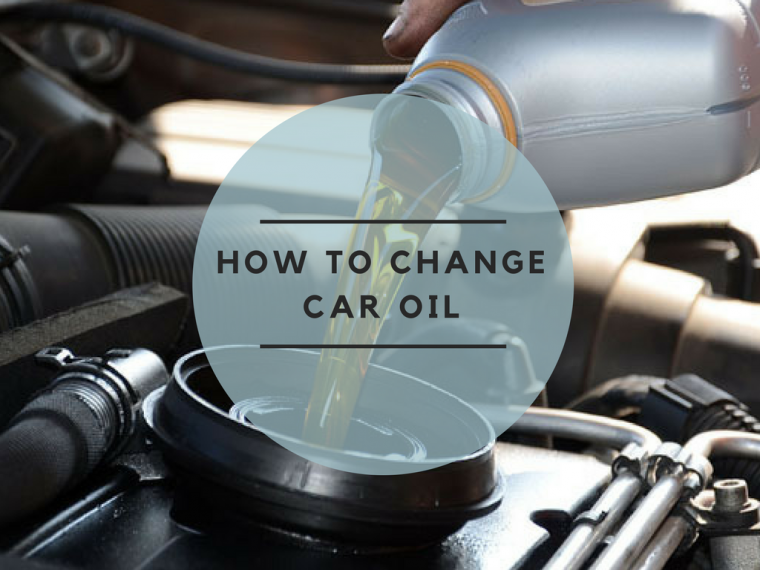 Why should you change the oil? 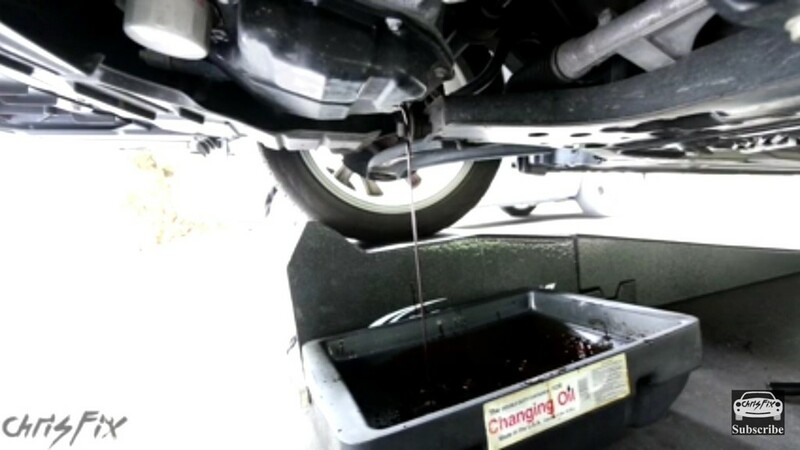 A common untruth about how often you need to change your vehicle’s engine oil is that it needs to be done every 3,000 miles or 3 months, depending on which milestone you reach first. While this figure might have been true for an older generation of cars, it is not the case for modern ones. The average car these days usually only needs an oil change every 5,000 miles or so, with some models being able to go anywhere between 7,500 and 10,000 miles before needing a change. Advances in engine design and improved engine oils have led to this dramatic increase in distance between changes. Engines are now able to run on either fully synthetic or a synthetic blend oil, both of which are designed to last longer than non-synthetic oils. So the real answer to “when should you change your vehicle's oil?” is it depends. There are a number of factors that influence how often you should be changing your engine’s oil. These include the model of your car, its age, the type of oil you use, and even how you use it. If you are someone, for example, who likes to rev the engine more than average, spend lots of time towing trailers, or do a lot of highway travel (5000 highway miles is the equivalent to around 1500 around town miles), then you will need to change the oil more frequently. Our top tip is to start by reviewing your owner’s manual to find out what the manufacturer recommends before visiting a dedicated site or two to get more information about when you should change your oil. Oil is the lifeblood of any vehicle. It lubricates the engine parts that move around and rub against each other. The average car engine typically has hundreds of components, around 40% of which spend their lives moving around in order to generate the motion that you need from your car. An unfortunate byproduct of all this movement is friction. Friction is a force that occurs whenever two objects move past each other in contact with each other. This friction then causes heat, which in turn generates even more friction. The part where engine oil comes in is that it helps to lubricate the engine, thereby lowering the level of friction. It also helps to absorb some of the heat generated, further reducing friction. Sadly, as time goes by, engine oil begins to break down becoming less and less efficient at reducing friction and absorbing the heat. The obvious result is that your engine begins to become increasingly less efficient and more susceptible to internal wear and tear. Regular oil changes are essential to keeping your car healthy. You should always ensure that you change the oil in accordance with the manufacturer’s recommendations in order to prevent damaging your engine. Run your car for a few minutes before you start the oil change. This will heat up the oil, which will make the change much easier because oil flows better when hot. You now need to prepare your car for the oil change. This involves making sure that it is parked securely in a place where you can do the oil change safely. Keep in mind that you will need room to get around your car and to slide under the front, so don’t try to do it in a cramped garage, for example. You should take care to make sure the ground is level and is solid for the ramps or jacks. Doing an oil change on concrete is the preferred choice unless you happen to have a pit in your garage. If using ramps, place them level with your car’s wheels and then drive your car up onto the ramps after taking a small run-up. As soon as you feel your car lift up, come off the throttle and gently apply the brakes. Don’t jam on the brakes as this could cause the ramps to slip. After the car is in a safe position, make sure the handbrake fully engaged and that the car is in gear with the engine off. You can also place chocks under the back wheels for added security. For those people using jacks to lift the front of their vehicle, this is the time to do so. Jacks should always be placed on a firm surface such as thick concrete, brick, metal, and even wood. Remember that it only takes one jack to slip for your life to be ended. So please take the time to do this carefully. Your car is now ready for its oil change. 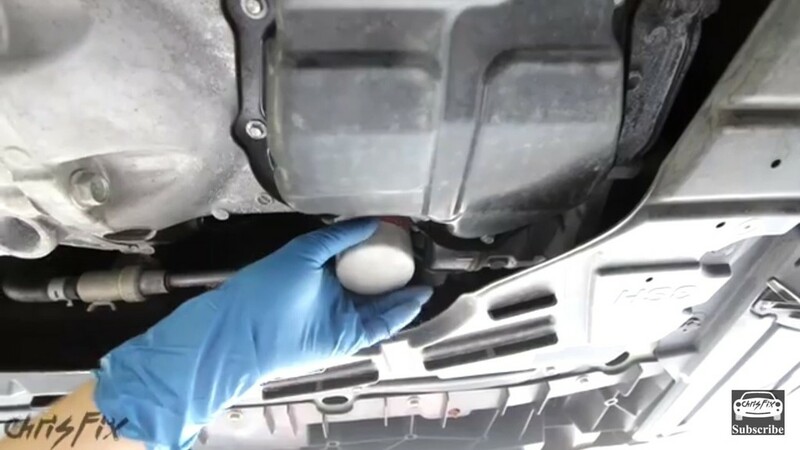 Begin by loosening the oil filler cap which can be located on the top of the engine. This will help the oil to drain more quickly through the engine. Underneath the engine on the rear side of the engine sump (pictured), you will find the oil drain plug. After placing the oil drain pan under the oil drain plug, loosen the plug with the socket wrench before undoing the last few turns by hand. Tip: The oil will flow out at an angle away from the engine due to the pressure, so be ready to adjust the drain pan accordingly. Wait until all the oil has drained out before replacing the plug and tightening it to the same pressure as before. Note: Please remember that your engine oil will be hot. Never do an oil change straight after running the car for more than a few minutes as the oil will be hot enough to cause serious burns. Using your filter wrench, gently undo the oil filter before removing it by hand. It is a good idea to place newspaper on the floor under the filter as it contains oil which can drip out as you remove it. After you have removed the filter, use your rag to clean off any old oil around the filter mounting in preparation for adding the new one. Make sure that the gasket is still on the mounting and is not stuck to the old filter. Once the filter mount is clean and you are sure the gasket is still attached, you can now install the new filter. 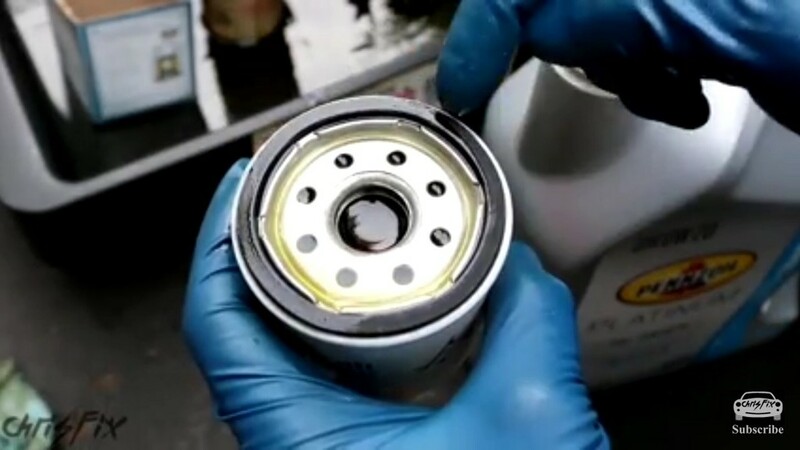 Before you do, fill the oil filter with new oil before then wiping a small amount of fresh oil over the filter’s seal to prevent it from sticking. After you have done so, gently screw in the new filter by hand until tight. You won’t need to use the wrench to tighten it, unless your manual otherwise states you must. You are now ready to add the new engine oil to your car. With your rag handy in case of any spills, use a funnel to pour engine oil into the refill hole that is located on top of the engine. Remember to pour slowly to prevent spills. It is important to occasionally stop pouring to check the oil level in the engine. This is done to prevent you from accidently overfilling the engine. To do this, simply let the oil settle for a few moments before using the dipstick to check the level. Please note that you will need to slightly overfill the engine because once you start it the oil will circulate throughout the engine causing the oil level to drop slightly. After you are done, screw in the filler cap and wipe away any oil spills. There is one last step before you are done. In order to make sure that the oil level is really at the right level, you should run your engine for a minute or two before rechecking the oil level a final time with the dipstick. The oil level should now be within the part marked as ‘full’ on the dipstick. If it is not, then add more oil until it is. There is no need to further run your car at this stage as the oil has already circulated around the engine. Tip: Take a moment to check the seal around the oil filter as well as around the oil drain for leaks. If you find any, you will need to further tighten them until it stops. If the leak around the filter is quite severe then you may have forgotten to reattach the gasket, or it could be worn out and need replacing. You are now free to take your car off the ramps or jacks and use it as normal. When disposing of the old oil and filter please do this in a government-sanctioned oil recycling center. Never pour old oil down the drain or burn it as it will cause environmental damage. When it comes to your car, maintenance is king. For this reason, you should always follow the maintenance guidelines that can be found in your vehicle’s owner’s manual. You should only attempt to repair your car if you have all the appropriate tools. Don’t ever attempt to use the wrong tools as this could damage the vehicle and even cause a serious injury. If you are not sure what you are doing then seek professional help before attempting any repairs. By following this step by step guide you will be able to safely undertake an oil and filter change on your car. Please remember to always check your vehicle's manual to confirm the type and amount of oil that you require, and to always heed the safety warnings that we have outlined. That’s it! You are ready to make your first oil change. Good luck!